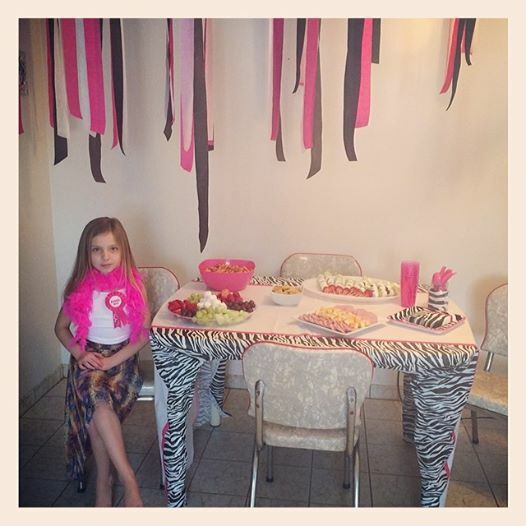 This past weekend we had a wild and crazy birthday party for my daughter Hailee. She turned 9 on February 20th but with that being her weekend with her father we had to plan it for a weekend she was home with me to have all of her little girlfriends over. 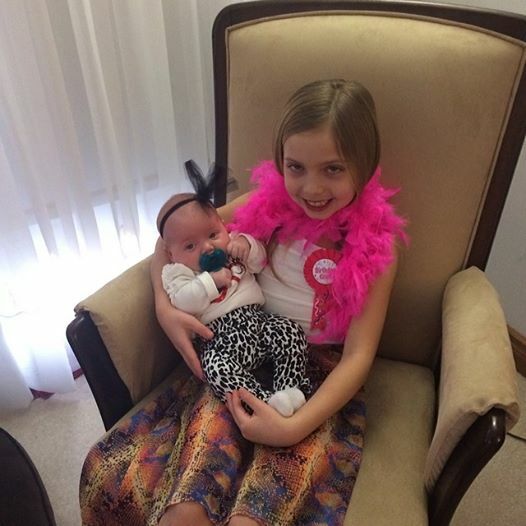 Since Hailee’s birthday falls in the winter months it is much different from her older sister Abby’s parties which I can hold outdoors and just let the kids go wild in the backyard. With having 8 girls between the ages of 7 and 11 inside I needed to come up with a strategy to keep my sanity for the 4 hours they would be here. Having worked in a daycare in the past I always come up with creative activities for kids to do that they actually enjoy doing. Of course this being an “older” girls party, pin the tail on the something just wouldn’t cut it this year! 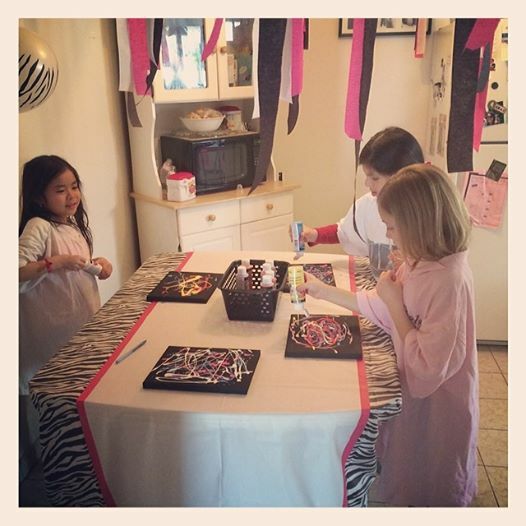 As I planned her party and picked up her decorations I wondered what I could have the girls do to pass some time during the party and keep them from just running wild. Last year for Mother’s Day Hailee made me a beautiful piece of artwork that I proudly hang in my kitchen and that is what gave me my inspiration for a great craft for her and her friends to do during their party, something they can hang in their own room which will always remind them of the fun they had at her party! I knew I could do this on the cheap with a little help from the Dollarama. While there picking up some goody bag items for the party I found canvases for $1.25 each which is a great price for canvas. Now of course they are not the “best” canvas but we are not Leonardo DiCaprio … um I mean Leonardo Di Vinci, so they were perfect! I also picked up bottles of Acrylic paint in various colours as well as a bottle of black. In total it cost me $11.25 for 9 canvases and $10.00 for the paint. The best part is the paint bottle still have tons left in them so now they will go in the girls playroom for future arts & crafts adventures. The night before the party I took out all of the canvases and gave them two coats of black paint using sponge brushes I also picked up at the dollar store for $1.00. This was the colour I chose to be the background for their art to really make their creation pop off the canvas but you can choose any colour you like. I found two coats was needed to cover up the white canvas. 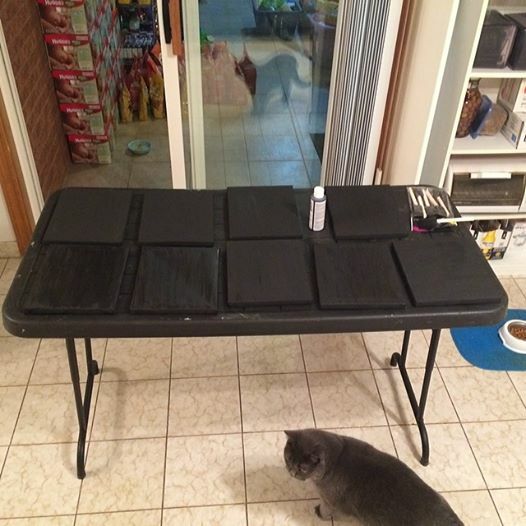 When doing this make sure to paint the sides too so the whole canvas is covered! I made sure to purchase one extra canvas for myself to demonstrate to the girls what to do and to explain to them if they squeezed the paint bottles too hard the paint will come out in big blobs so be sure not to squeeze too hard but use different pressure on the bottle to make different thickness of lines/dots. 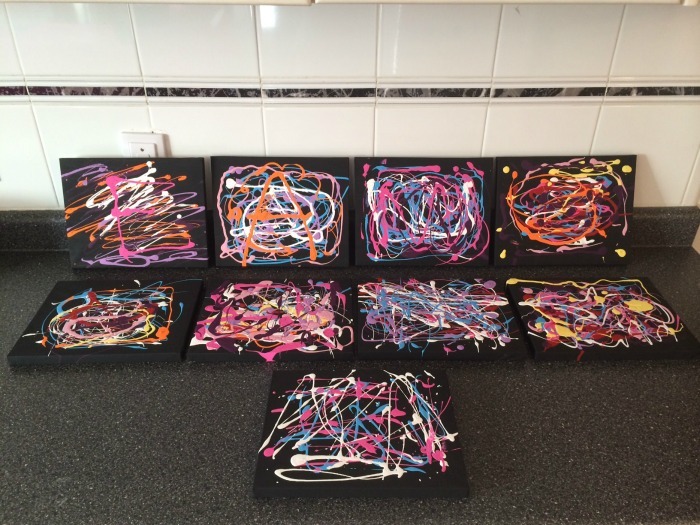 Once I demonstrated what to do the girls were off creating amazing pieces of art – quietly ahhhhh my plan worked! Now depending on your length of party you might want to plan this for the very first activity they do to allow time for drying. Our party started at noon so the first thing we did was eat. Afterwards we did our craft but by the end of the party not all were dry as some used more paint than others. If the paint isn’t fully dry that is okay, we just let all the parents know that Hailee would be bringing the girls their art to school this coming week once they were dry. You could also give parents the option of taking the wet art home, just being careful to place it somewhere in their vehicle where it won’t move or have anything fall on it. 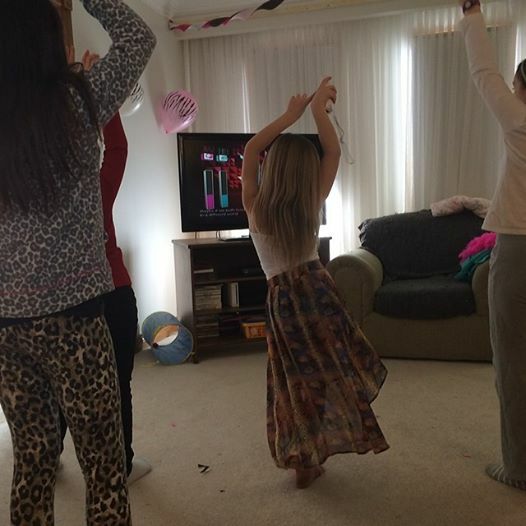 Other things the girls did at the party which cost me absolutely nothing and kept them occupied for hours was play Just Dance on the Wii. The girls had great fun dancing to tunes and I am sure this helped tire them out for their parents, I know my girls were wiped by 7pm. We have extra remotes but even the girls who didn’t have a remote would still dance along until it was their turn to use the remote! 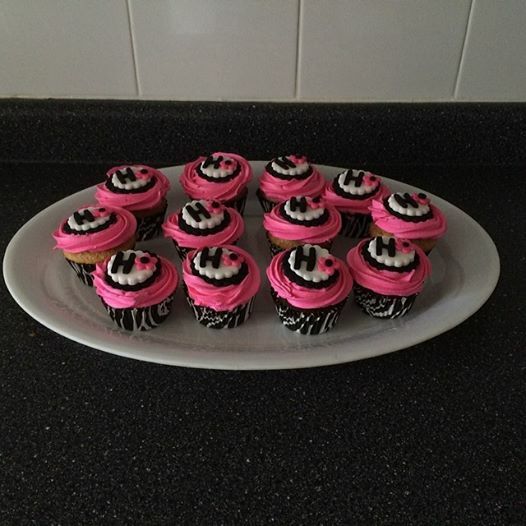 Here are some other photos from the party, I knew it was a success when I could hear all the girls in the kitchen saying “this is the BEST party I have been to Hailee”. <– That makes me happy, knowing the kids had a great time is what it is all about! Be sure to check out your local dollar stores and get inspired to let the kids attending your children’s parties create something special that will always remind them of the great party they went to for their friend. 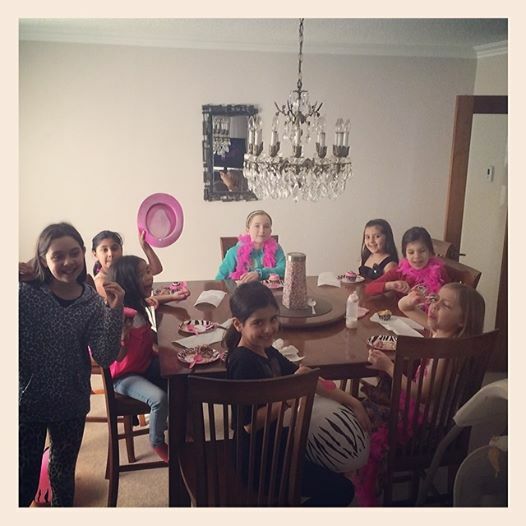 Do you have any frugal birthday party tips you’d like to share? Leave us a comment below! This looks like so much fun! Love the idea of creating a piece of art work to take home. A great memory for all the girls! This is a fantastic birthday activity! I think some of the parents would love creating a mini canvas too! Our parties usually happen in the yard too, so this works out perfectly! What fun! I want to go to that party! 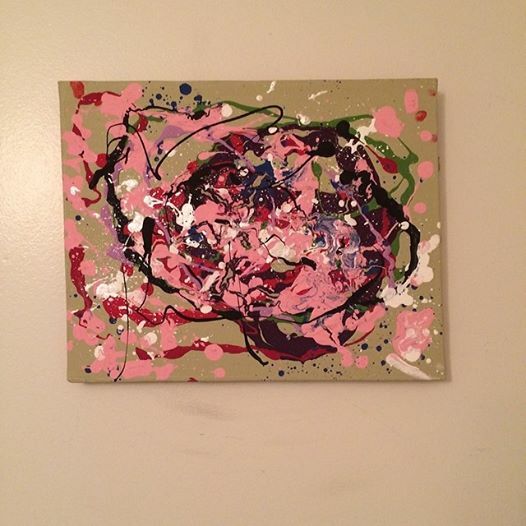 Kids have so much fun with art projects & it’s cool to see that creativity come out on canvas! I’m all for spending less on birthday parties & doing something original like this. And the kids looked like it was enjoyed, & they get to keep it forever. Win~Win! 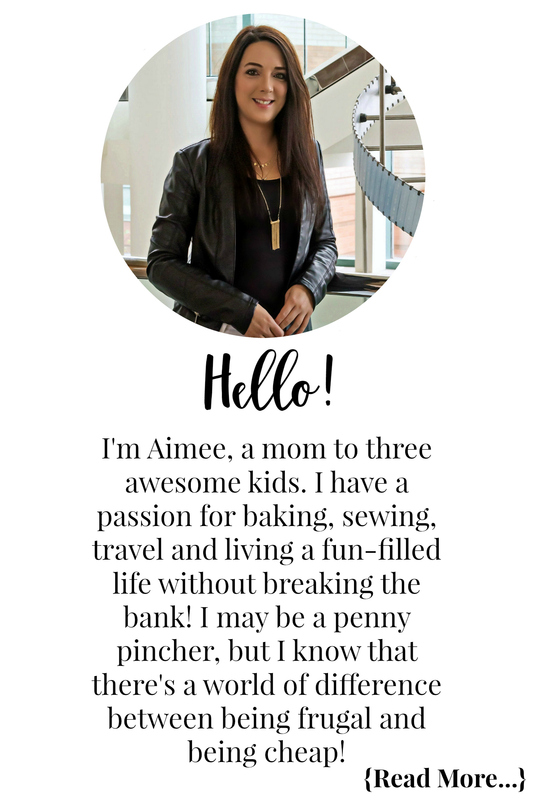 My kids are always into crafts and looking for something artsy to do. we will definitely be doing this! 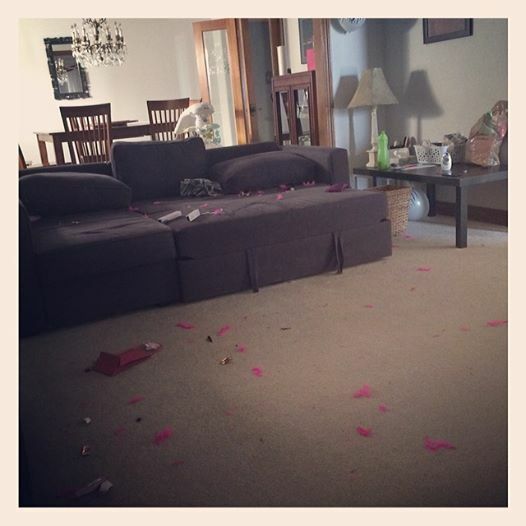 Certainly must have been a great party,is that a chrome table and chair set i see,it’s beautiful !